Also available in downloadable audio book from www.christianaudio.com. Below is a sample of the audio. We want to say or do something that helps our grieving friend. But what? 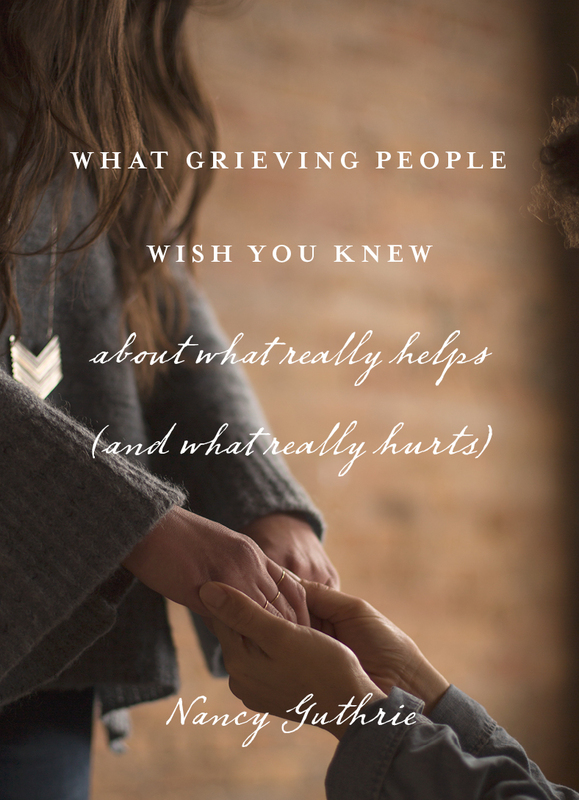 When someone we know is grieving, we want to help. But sometimes we stay away or stay silent, afraid that we will do or say the wrong thing, that we will hurt instead of help. In this straightforward and practical book, Nancy Guthrie provides us with the insight we need to confidently interact with grieving people. Drawing upon the input of hundreds of grieving people, as well as her own experience of grief, Nancy offers specifics on what to say and what not to say, and what to do and what to avoid. Tackling touchy topics like talking about heaven, navigating interactions on social media, and more, this book will equip readers to support those who are grieving with wisdom and love. Framing her own story of staggering loss and soaring hope with the biblical story of Job, Nancy Guthrie takes her fellow sufferers by the hand and guides them on a pathway through pain--straight to the heart of God. Holding on to Hope offers an uplifting perspective, not only for those experiencing monumental loss, but for anyone going through difficulty and failure. Includes a study section for readers who want to dig deeper into what the Bible says about dealing with suffering and grief. Additional sections include a Foreword by Anne Graham Lotz and a Resource section linking Scriptures with each chapter's lesson. This book is for anyone who has been hurt in life and would benefit from a hope-filled daily companion. Critically acclaimed author Nancy Guthrie offers insightful daily reflections based on the Word of God to comfort, encourage, and uplift those who are feeling the aches of life--whether it's because of everyday disappointments or deep losses. Through a year's worth of thoughtful entries, the reader will learn how much God longs to lift us up, carry us through in times of difficulty and uncertainty, and give us true, lasting joy. Each daily step draws you closer to a God who truly cares and the hopeful life he wants you to enjoy. In this paradigm-shifting book, Nancy Guthrie gently invites readers to lean in along with her to hear Jesus speak understanding and insight into the lingering questions we all have about the hurts of life—what was God's involvement in this, and why did he let it happen? Why hasn't God answered my prayers for a miracle? Can I expect God to protect me? Does God even care? All families eventually face the loss of a loved one. When it happens, it can place great strain on a marriage, as well as on other relationships. That's partly because we don't know what to do with our feelings and partly because every family member grieves in his or her own way. In this book, Nancy and David Guthrie explore the family dynamics involved when a loved one dies--and debunk some myths about family grief. Through their own experiences of losing two young children and interviews with those who've faced losing spouses and parents, they show how grief can actually pull a family closer together rather than tearing it apart.